Aggregate material serves many functions and can be found at the starting line of many construction projects. Aggregate material, which is mined from natural mountainside resources, is a necessary ingredient in the production of concrete. BoDean Co. aggregates are quality mined resources that can be combined to form an excellent base for materials like concrete and our own special blend of concrete aggregate blend. Concrete is often referred to interchangeably with cement, yet it is not the same thing. Cement is the binding agent in concrete production and the material which forces hardening. 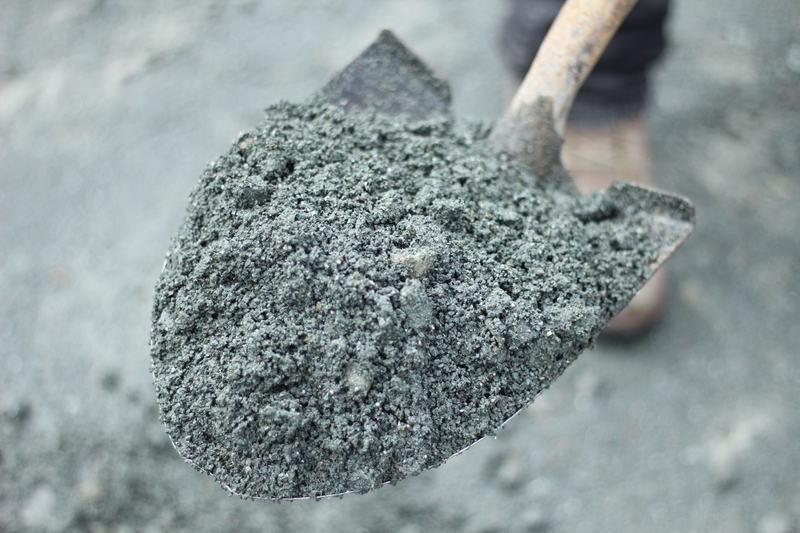 What is concrete aggregate blend? Concrete is essentially a blend of hard aggregate material that, when added to a binder like cement, and mixed with water will harden over time. BoDean Co. concrete aggregate blend is a blend of different sized rocks made at a BoDean quarry that can be purchased and taken to a construction site to be mixed with cement and water. Concrete aggregate blend developed and sold at BoDean Co.’s Mark West Quarry comes separately or in a combination of 3/8” x #8, 1” x #4, and American Society for Testing and Materials (ASTM) C-33 washed sand. Concrete aggregate blend can be used in a variety of applications by both homeowners or professionals. When faced with smaller jobs like repairing concrete walking paths or installing smaller patios, homeowners can use concrete mix without the need of a contractor. DIY Patio – The most common use of concrete aggregate blend by the average homeowner is in do-it-yourself projects such as backyard patios. Pouring concrete can seem like a daunting and intimidating task to the uninitiated, but the simplicity of using concrete mix makes the task easier to accomplish. Permeable Applications– Concrete aggregate blend is often used in permeable paving to allow water infiltration. Permeable pavement can be used in vehicle roadways or pedestrian walkways to reduce or eliminate the possible surface run off. Concrete aggregate blend is also used as a permeable layer when creating a paved walking path. Repair or Replace Damaged Concrete -Concrete aggregate blend is a great option for the repair or replacement of smaller patches of concrete. With the right tools, concrete mix can be used as an easy and less expensive solution for repairs by following a few fairly simple directions. Why Use Concrete Aggregate Blend? Concrete has many benefits making it one of the most desired materials in construction. Ease of Use. Concrete aggregate blend is highly desired because it is very simple to use. The pre-blended design of concrete aggregate blend allows this material to be used by an average homeowner just as effectively as a construction manager. Concrete aggregate blend is much easier to use than other options and can cost significantly less since high-skilled labor is not required. In just a few simple steps, concrete mix can be your first step to a brand-new patio. Step 1: Pour dry concrete aggregate blend into a wheelbarrow or bin and mix with the appropriate amount of water and cement binder. Step 2: Work it with a shovel to the correct consistency. Step 3: Clean up promptly. Wash all tools as soon as possible to keep the concrete from hardening on them. Strength and Durability. Concrete is used in many applications making it a desirable material for everything from DIY home projects to major construction and building projects. The lifespan of concrete when compared to other building materials is significantly longer. Highly Sustainable. Concrete is a highly sustainable material. It uses less energy than other comparable building materials because it has the ability to absorb and store significant amounts of heat. Concrete is also highly recyclable and has the ability to be re-crushed and reused in other applications. Concrete holds many benefits and the use of BoDean Co.’s concrete aggregate blend is an ideal solution for various applications. When considering a product like concrete aggregate blend, it is important to be sure your ratios are accurate when blending the concrete aggregate blend with cement and water. Slowly blending will help make sure you the appropriate consistency is reached. Does your next project require the use of concrete? Choosing the right products are the first step in the right direction. Concrete aggregate blend will allow you to do the job at your pace, on your time table in the most economical way. At BoDean Co., we supply the highest quality aggregate material in our concrete aggregate blend, ensuring that your concrete job will be successful. The knowledgeable consultants at BoDean Co. are expertly trained and highly skilled in selecting the right materials for whatever your job may be. They are waiting to help you select the right material for your project. To schedule a time that works best for you, simply call today at (707) 576-8205 to speak with a BoDean Company specialist or click here to request a free online quote.